Phonak have now completed the launch of the new and very interesting Audeo B-Direct in the US, UK and Ireland. The concept for the device has been fascinating and it is the very first ever Made For Any Phone hearing aid. That means that the hearing aids will connect directly to any Bluetooth enabled mobile phone, no streamer and no hassle. Let's talk about the hearing devices, what they offer and some important points you need to consider before you buy them. As I have said, this is the first ever Made For Any Phone hearing aid, that means it will connect to iPhones, it will connect to Android Phones and it will connect to pretty much any phone that has a Bluetooth connection. So if you refuse to give up your old Nokia 5210 (pry it from my dead hands!!!!!) well then you are in luck. However, there are pros and cons here, caveats to the direct connection that you need to understand, so let's talk about them. The main pro here apart from the fact that it will connect to any phone is that the devices give you amazing freedom from your phone. They act as a wireless headset, allowing you to both answer and refuse phone calls with a touch of the button on the hearing aids. They also act to stream the call to the aids and to stream your voice back to the caller. Simply put, you don't need to touch your phone, it could be twenty feet away and you can still take a call and speak to the caller without ever needing to look for it. That is complete freedom. Unfortunately, the audio from the call is only streamed to one ear, however, in order to give you the best opportunity to understand, the attenuate the microphones on the opposite ear. I have not tried them, but I have spoken to someone who has. They said that the call is exceptionally clear and presented no issues even in a slightly noisy sound environment. Phonak also has a feature called Environmental Balance which will allow a user to increase the streamed audio volume over and above their surroundings. They have claimed that it can give up to a 30dB advantage in signal to noise improvement, that is a helluva lot. The second thing to consider is that you can not stream audio other than phone calls from the phone. So no music or audio books, just phone calls. But again, the phone handling feature is outstanding and delivers real benefits as discussed. In fact pretty amazing audio from any sound source once it is connected to their new TV Connector. I talked to a few people who had got a chance to listen and they were impressed by the clarity and fidelity of the sound. That means that listening to audio at home either while watching the TV or just listening to music will be a pleasurable experience without interrupting anyone. 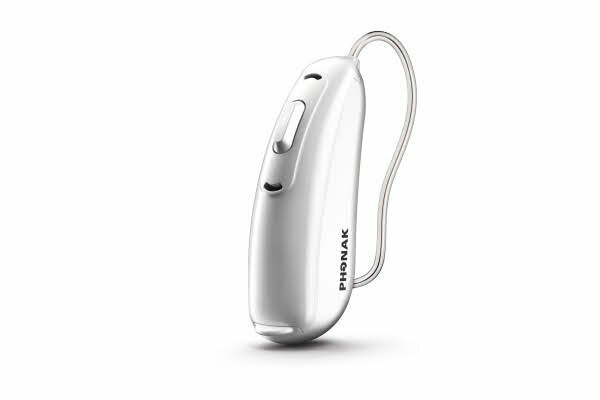 The devices are a size 13 battery powered Receiver In Canal (RIC) hearing aid that will be available in the top three levels of technology, that's the B90, the B70 and the B50. They also use the new and updated Autosense OS which brings the tweaks that have ensured the Belong range is superior to the Venture range. The devices will handle three levels of power, the standard receiver, the power receiver and the ultra power receiver which will cover hearing losses from mild to severe. However, in the B90 and B70, they do not have all of the features of the other aids in their technology levels. Because of the chipset that Phonak are using they lack the ability to stream audio in an inter ear manner. Phonak have become famous for the use of inter ear audio to deliver better results in certain sound situations for people with hearing loss. That is a loss of some pretty amazing features for hearing in complex sound situations. So you need to be aware of it when you are making a decision on purchasing. There are no other surprises, nor is there much else that you need to know. Apart from what we have discussed here, the Audeo B-Direct is similar in nature to other Audeo hearing aids at each technology level. These are pretty solid hearing aids that offer an outstanding mobile phone capability that is unique. No other hearing aid on the market offers this type of headset connection to mobile phones or the complete hands-free use. However, there are caveats, because of the nature of the devices you will lose out on some pretty excellent features.